Delicious Campfire Seafood Boil recipe, an easy campfire recipe for a crowd or large group. When I go car camping with my friends we usually spend two weeks just planning the camp menu alone. We are definitely a little food obsessed and enjoy eating tasty food. 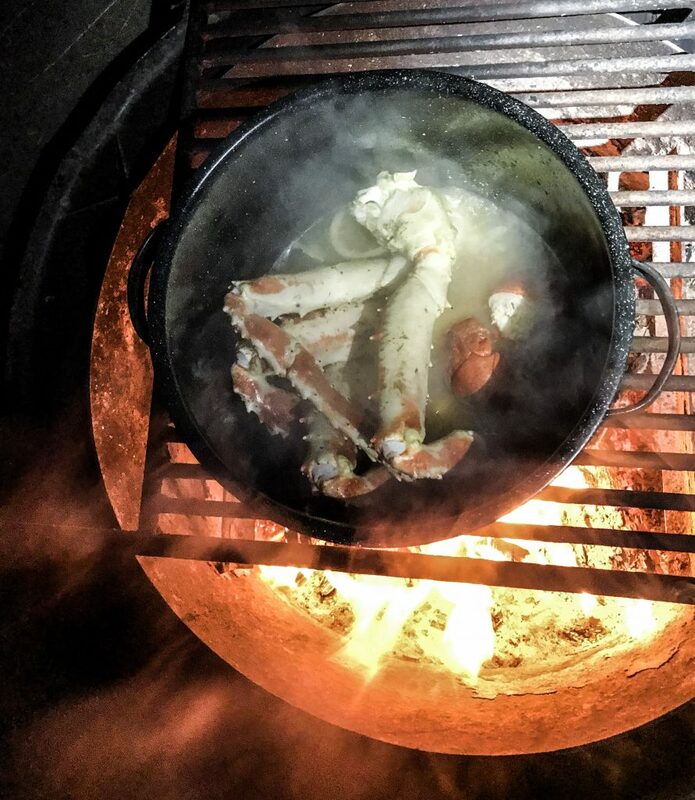 On my last trip, we wanted to enjoy a “nice” dinner one night but still wanted something easy so we opted for a good campfire seafood boil. This might seem like a lot of work or a little over the top but it was one of our easiest meals to cook and can be tailored to any palate plus it’s easy to scale for a crowd or large group. We went big with lobster and crab but you can keep cost down by using crawfish or shrimp. The key to is to purchase frozen seafood the night before you leave and eat it within the first two nights of your trip. As long as you keep your seafood frozen, it will be super fresh and delicious when you go to eat it. 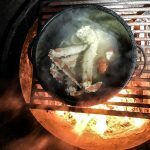 You will need a decent sized pot that will fit your seafood while withstanding the fire. Cut lemons in half, squeeze juice into the pot and add entire lemon to the water. Add Old Bay seasoning (adjust amount to desired taste). Place pot over the fire and heat to a boil. Add Lobster to the pot and boil. After 5 minutes, add the potatoes to the pot and cook for an additional 5 minutes. Add the crab, sausage and corn to the pot and cook for an additional 10-15 minutes. Remove pot from the heat and serve! Tip: If you want, heat butter in a small saucepan with a little Old Bay seasoning for dipping. Goes great on the seafood, potatoes and corn.